Suitable for warehouse, factory, supermarket, stadium, etc. 2). With 100% 72hours Aging test to ensure good performance and reliable use before shipping out. 3). Full impact time> 1 hours for both sides. 3) Complete & strict quality control system from incoming material quality control, procession quality control to ready prodcut quality control. 6) AOK Industrial Company Limited isa leading specialist of LED lighting industry of China. 8) Warranty: 5- 8 years warranty. 9) Certificate: UL cUL, GS, CE, SAA, RCM, CB Listed. 10) High quality & high performances products are what AOK guarantees to customers, Technical support, satisfatory & in time service is what AOK offers to customers. 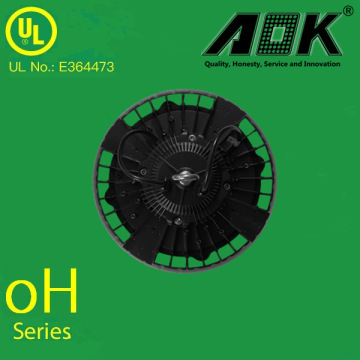 The general failure rate of AOK lamp is less than 0.2%. The general failure rate of AOK main products are even less than 0.1%. AOK strictly following the quality control system. And AOK's factory is both ISO9001 and ISO14001 certified. Picture No. 5~6 Dark Room for testing IES files and other Photometric datas. To know market trend and new products better, AOK is alway active in different kinds of Lighting exhibitions. 1. AOK attends HKTDC Lighting Fairs Spring Edition April 9th ~ 12th. 6. AOK attended LED Show in US in March 2016. 7. AOK attended Lightfair International in US in April 2016. 8. AOK attended Electric Power & Lighting in Australia in June 2016. 2). AOK not only produce and sell products, but also bring trust and reliability to customers. Feedbacks of UFO high bay light from AOK customers. Please check with our sales staff for the details. Where should I use this lamp? 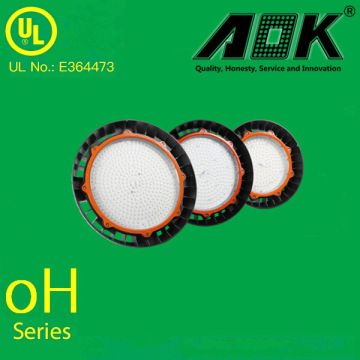 AOK oH series UFO high bay light suit for warehouse, sports stadium, workshop, also outdoor on the pole, etc. We accept payment via TT, Paypal, Western Union and Letter of Credit, and we offer ExW or FOB terms. 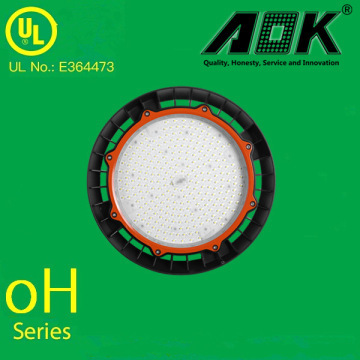 We ensure and guarantee the production quality of all AOK products, either sample order or formal order, with AOK's quality control process, we achieved less than 0.2% general failure rate, this was based on our sales records in the past 5 years. Yes we can provide OEM and ODM product, with customized label design on the product and carton box. Or customized carton box, and laser print logo on the lamp fixture. Our standard lead time for sample is 5-7 days, and normal order lead time is 7-10 days. For large order lead time, please also check with our sales staff. 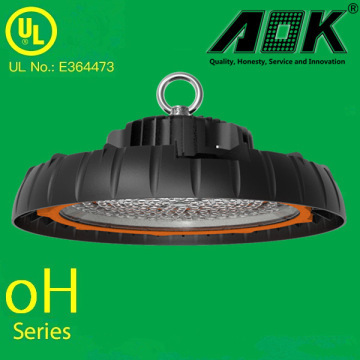 AOK LED Light Company Limited is a professional outdoor LED light manufacturer since 1998 with main products of LED high bay light, gas station canopy light, parking lot light, street light, etc. All of our main products have UL , TUV-GS and SAA Certifications. Shenzhen AOK LED Light Company is a professional manufacturer of outdoor LED light.